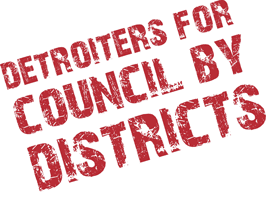 Detroiters for City Council by Districts is aggressively ramping up its efforts to collect 31,420 signatures by August 4, 2009 in order to put the district system proposal on the November ballot. More than 10,000 signatures have been collected to date and there are more than 100 days left to collect the rest of them. Electing our City Council by district, in my opinion, is absolutely vital for Detroit. Far too often, the Detroit City Council has obsessed over one thing or another downtown while the needs of the neighborhoods have gone unattended to. A district system will go a long way towards making sure a neighborhood's desire for police and fire protection don't get forgotten about in the City of Detroit's budget. More information about this effort, and details on how you can get involved, are available here. Is snake oil medicine from the same people who sold us - on term limits for legislators..
You'd think we never had council by district in Detroit, the way people are hailing it as the the way to turn Detroit around. You know why we don't HAVE council by district now? It's because we HAD it, and it was AWFUL! So we GOT RID of council by district! Rushing headlong to council by district will be as dumb as repeating Vietnam in Iraq.